The end of June marks the passing of Royal Ascot as well as four of the five British Classics and represents something of a halfway mark for the flat turf season. So who have been the top performers in the early part of the campaign, and where do those performances rank against recent seasons? Mark Johnston and Richard Fahey tower above their opposition in terms of number of winners, the former expected to achieve his century of 2018 domestic flat turf scores before Newmarket's July Festival commences on Thursday. Those 97 winners to date have come from 484 runners, at an excellent 20% strike rate. Only blue-blood trainers John Gosden and Charlie Appleby have been able to surpass that hit rate and from far fewer runners - just 324 combined. Indeed, 'Always Trying' has a better win rate than all of Messrs. Varian, Stoute and Haggas; and way better than the other 'volume boys', Fahey, Hannon, Easterby, and O'Meara. Moreover, Johnston has scored with 64 individual horses, from 139 he's saddled, to record a 46% winners-t0-runners ratio. That is well clear of the next best, Mick Channon, who is the only other top 20 trainer with a winners-to-runners tally of 40% or better. From a betting perspective, you'll merely go skint more slowly following the Johnston battalion, his 97 winners having lost 7% of stakes overall. Of course, there is scope to investigate further within such an ample dataset. Class Kings: Clouds above Ballydoyle? Looking only at Class 1 races - Listed, or Group 1, 2, or 3 - we see a familiar roll of honour. Familiar, yes, but it is a surprise when Aidan O'Brien is not top of the pile in Pattern class either side of the Irish Sea. In fact, as can be seen from the below, Ballydoyle is enduring what for them amounts to some sort of existential crisis. Not only is that firm winning at a single figure strike rate for the first time since 2010, but they've also managed a solitary Irish G1 score this year (and that with a 116 top-rated horse in the often substandard Tattersalls Gold Cup). It's all relative, of course, their current 2018 haul of four Group 1's in Britain - Saxon Warrior in the 2000 Guineas, Rhododendron in the Lockinge, Forever Together in the Oaks, and Merchant Navy in the Diamond Jubilee - matched only by John Gosden. The second half of the season will be interesting at the top table, with Joseph O'Brien having claimed his maiden Classic, and Gosden continuing his ascendant trajectory hitherto in 2018. Again, though, such sustained dominance is not lost on the market. Looking at overall datasets and/or top class racing gives us much the same perspective on life as the rest of the punting populace. But when we niche it down a bit, we have a chance to find some less obvious top performers. The problem, as always when looking at racing data, is trying to find the sustainable (even in the short term) angle amongst the happenstance. 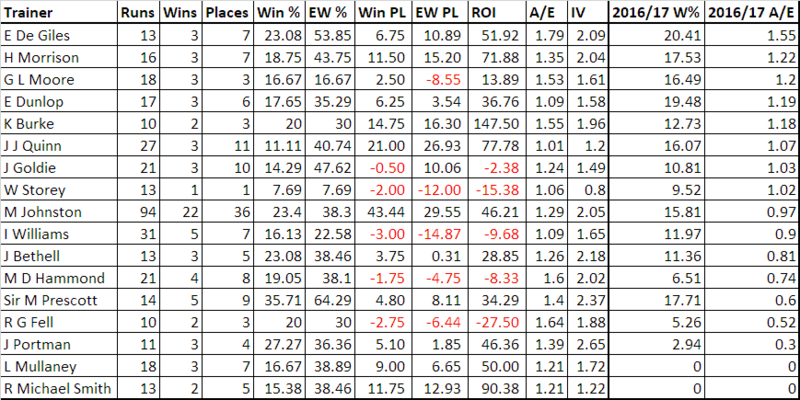 To that end, below is a table of those trainers recording an Actual over Expected figure at SP of 1.00 or more (50+ runners), and I included Mark Johnston (A/E 0.99) for good measure. Appended to the table are the 2016/17 win strike rate and A/E figures, the latter by which the table is sorted. (*A/E is, in basic terms, a measure of market expectation, north of 1.00 being a positive expectation). Sorting by 2016/17 A/E immediately highlights the fact that most of this season's punters' pals thus far do not have a solid historical record in that context. The exception is the (clearly) under-rated Ed de Giles, whose handicap hit rate of around 15% is both steady and well above average (Impact Value, an individual to peer group comparison - in this case Ed de G vs all handicap trainers - holding steady at 1.52 where, again, north of 1.00 is positive). With the exception of 2015, de Giles has been impressively consistent for seven years now, and is a trainer worthy of note in the handicap context. Some trainers excel with fillies, some with stayers, and some with the quicks. When the sample size is big enough (relatively speaking, of course), it pays to keep digging until you find the treasure... or at the bottom of a great big hole! The top five UK turf sprint handicap* trainers of 2018 to date (based on A/E, 25+ runners) are Nigel Tinkler, Eric Alston, Roger Fell, Mick Appleby, John Quinn and Ron Harris. Rather than show you how well they're faring this year, however, below is how they fared in 2016/17 combined. All of these trainers, bar Eric Alston, merit close scrutiny when they've a runner in a race in which you intend to bet. There appear to be less staying handicaps in the programme book than sprints, a function of breeding fashion no doubt, but it can still pay to keep an eye on those who condition their horses to run and run. The below compares the top staying handicap trainers (UK flat turf, 1m4f+, 10+ runners) this term with their win% and A/E for the previous two seasons combined. Ed de Giles again tops the pile(s), his place strike rate further emphasizing how consistent he is. Others of note are Hughie Morrison - look out for him particularly with handicap debutants stepping up in distance - and Karl Burke. It has been a fascinating flat season to date, notable at the headline level for the volume dominance of Mark Johnston and the usurping of Aidan O'Brien by John Gosden at the highest altitude. Sifting through the handicap ranks for punting morsels, Ed de Giles, Hughie Morrison and Karl Burke should be noted stamina trips, while John Quinn, Ron Harris, Roger Fell, Mick Appleby and Nigel Tinkler continue to threaten to offer value at sprint distances. The above insights were all derived using geegeez.co.uk's Query Tool, a facility which forms part of the Geegeez Gold provision. It's a tool we're continuing to develop and enhance, and one where we have some exciting plans for the rest of the year.